(186 x 258 mm) 11.7 x 16.5 in. A3 Size 10 x 14.9 in. (272 x 377 mm) 11.7 x 16.5 in. The Medicine Buddha (Tib. Sangye Menla), or ‘Medicine Guru’ (Skt. Bhaishajyaguru), is also known in Sanskrit as the “King of Vaidurya Light” (Vaidurya-prabha-raja), with vaidurya being the blue-beryl or aquamarine gemstone. This relates to the bright blue light rays that emanate from his body that dispel the darkness of the ‘three poisons’ of ignorance, desire, and aversion, which are the causes of imbalances in the three corresponding humors (Skt. dosha) of phlegm, bile, and wind. Bhaisajyaguru is also recognized as the aspect that Shakyamuni Buddha assumed in order to reveal the medical tantras, and his meditation practices are performed to cure physical diseases, alleviate mental and emotional disorders, and eliminate the obstacles to health, happiness, longevity and harmony. The Medicine Buddha's Pure Land is known as Shudarshana, meaning 'Beautiful to Behold', which is also identified with Indra's paradise, the heaven of the 'Thirty-Three' (Skt. trayastrimsha), which is located at the summit of Mt Meru. 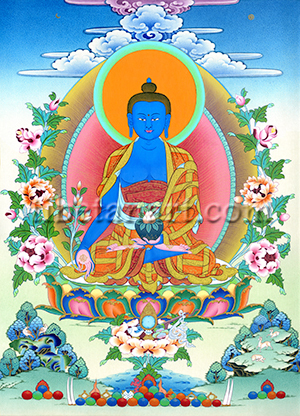 The Medicine Buddha is deep blue in colour and he sits in vajra-posture upon a white moon disc and a multicolored lotus. He is adorned with the thirty-two major and eighty minor marks of an enlightened being, his palms and soles are adorned with eight-spoke golden wheels, and he wears the three embroidered orange-red robes of a bhikshu or Buddhist monk. With his lowered right hand he makes the varada-mudra of supreme generosity as he holds the triple-fruited stem of a medicinal myrobalan plant (Lat. Terminalia Chebula). With his left hand resting upon his lap in the dhyana-mudra of meditation he holds an alms-bowl made from dark blue beryl that contains the nectar of immortal wisdom, and a cluster of myrobalan fruits and leaves. Various parts of the myrobalan plant and its plum-like fruit (Skt. haritaki; Tib. arura) are widely used in both the Tibetan and Ayurvedic medical traditions as a panacea and to help cure many different kinds of illnesses. His radiant aura is adorned with a symmetrical array of beautiful flowers and leaves, with an open lotus arising from the lake below him containing the auspicious objects of the five senses: a mirror (sight), a lute (sound), fruits (taste), a conch filled with perfume (smell), and a white silk ribbon (touch). Three rows of stacked jewels appear in the lower foreground, with the seven insignia of the chakravartin or ‘universal monarch’ appearing behind them. Medicinal bushes and trees surround the jewel-like rock formations in the lower corners, with birds and deer resting peacefully upon them.